Many states have invested in data, tracking, and evaluation to improve state agencies’ performance in child welfare programs, which serve a vulnerable segment of the population that includes abused and neglected children. Prodded by past scandals and court orders, the State of Tennessee today has one of the nation’s best performance-contracting systems for its child welfare program. In this report, Patrick Lester documents its evolution and use, and how Tennessee has avoided some of the common design flaws endemic in other social service programs using the performance-based contract model. Lester also contrasts the use of performance-based con­tracts with a new form of performance management: social impact bonds. He observes that social impact bonds may be a way to identify and resolve potential program design flaws in small-scale pilots before using performance-based contracts to scale-up a new program or intervention technique. 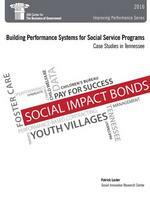 The report also includes a rich case study of how a non-profit provider in Tennessee, Youth Villages, has developed a nationally-recognized performance management system, in part as a response to the state’s performance-based contracting approach. The case study provides rich details about how Youth Villages has developed and uses its performance management program, and it provides a granular description of its core indicators. These details can be helpful to other providers who may want to develop similar per­formance management systems.